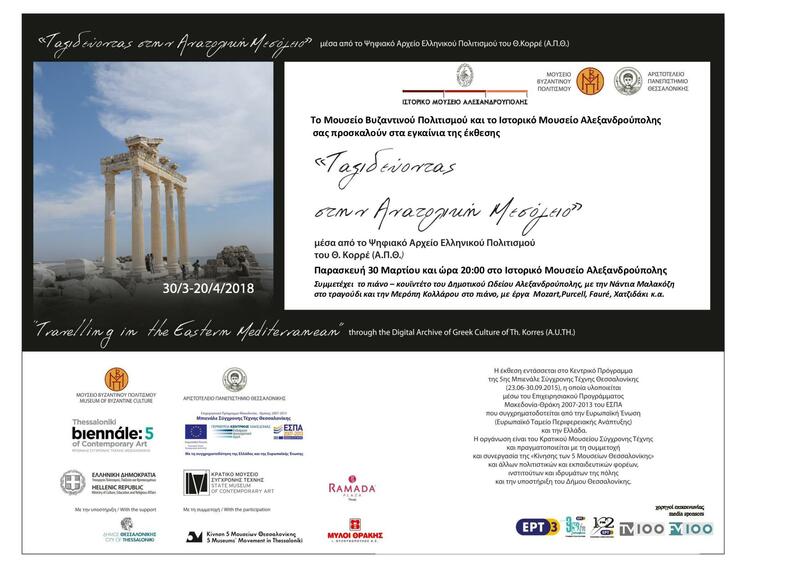 The Historical Museum of Alexandroupolis, in cooperation with the Museum of Byzantine Culture, present the temporary photographic exhibition, titled “Traveling in the Eastern Mediterranean through the Digital Archive of Greek Culture of Th. Korres (A.U.TH.)”. The opening of the exhibition (30 March – 20 April 2018) will be held on Friday 30 March at 20:00. The piano quintet of the Municipal Conservatory of Alexandroupolis, with the singer Nandia Malakozi and the pianist Meropi Kollarou, will perform a Chamber Music concert with works of Mozart, Purcell, Fauree and Chatzidakis. Theodora Apostolidou (flute), Viktor Zazopoulos and Christina Panagiotidou (violin) and Giorgos Tolidis (cello) will also participate. The exhibition, which was designed and organized by the Museum of Byzantine Culture, was firstly presented in the Museum in Thessaloniki and it was part of the events of the 5th Thessaloniki Biennale of Contemporary Art, under the action of the five major city museums, known as the “Movement 5M”. It was then presented in several cities of Greece (Athens, Karditsa, Nikiti in the Chalkidiki peninsula, Serres) with great success. It aims to show to the public a series of more or less known places with a strong Greek presence over time, as well as ecclesiastical and secular monuments that have survived until nowadays and their common feature is their position along the coastline of Eastern Mediterranean. The exhibition is based on the photographic material, gathered during the educational trips of the Department of History & Archaeology (A.U.Th. ), and it is structured into seven sections, leading visitors to an imaginary route that departs the region of the northeastern Aegean coastline in Asia Minor and moves to the southeastern part of the Mediterranean basin, to arrive in the Sinai peninsula and Egypt. In particular, the first section presents sites and monuments from the ancient regions of Aeolis and Ionia, including Assos, Aivali, Pergamon, Skala Vourlon and Alatsata. The second section includes Kirkintzes, Ephesus, Priene and Didyma in Ionia district, and Philadelpheia in Lydia district. The third section consists of Livissi, Kekova, Myra and Phaselis from the district of Lycia. The route in Asia Minor is completed in the fourth section, which includes cities and monuments on its southern part. These are Attaleia, Perge, Side (Pamphylia) and the monastery of Alahan (Cilicia). The section of Jordan follows, where the capital Amman (ancient Philadelpheia) and the city Madaba are presented, and at the end of the section we have Mount Sinai and the famous monastery of St. Catherine. The exhibition is completed with the seventh section, which has Egypt as a subject, presenting the church of St. George of the Greeks in Cairo and the Modern Library in Alexandria. The photos are framed by captions and at the beginning of each section there are texts and maps of the regions that are presented. In the Historical Museum of Alexandroupolis, due to lack of space, we do not show all photos, but only one photo of each city or site, with the exception of Sinai, from where two photos are displayed. We believe that this exhibition, due to the originality and the scarcity of the subject, as well as due to the geographic and chronological scope it covers, presents important evidence for the history of Hellenism. At the same time, it promotes a modern way of collective effort. The effort to get acquainted with archaeological sites, monuments, settlements, places with the timeless presence and action of Greek communities. Theodoros Korres, Professor Emeritus in the A.U.Th.